This crop is sold out for the season. Please click here to view the crops that are in season now. Purple Beauty Bell Peppers grows on compact plants which produce a good yield of blocky, deep-purple peppers. Their mild, sweet flavor and unique color make them a perfect addition to a salad. Soil & Water & Food: Peppers require deeply-worked, well-drained soil with plenty of added organic matter and a pH of 6.0-6.8. Water deeply, but don't over water. The soil must drain well, yet hold enough moisture to keep the plants in production. To maintain a proper balance, work some organic matter such as compost or humus into the soil when planting to enhance moisture retention. Use mulch to prevent excessive evaporation from the soil during the dry summer months. Don't overfertilize. This tends to make the plants develop lush foliage at the expense of fruit production. Harvesting & Storage: Harvest the first fruits early to encourage continued production through the season. Cut (don't pull) the fruit from the stems. These peppers may be harvested from the green stage through the color changes. Did You Know? Sweet peppers are loaded with vitamins C and A. Red peppers contain twice the vitamin C and eleven times the beta carotene of green peppers. You have several options to make your garden perfect for you. Did you notice that some planter choices are missing? That is because not all planters are suitable for growing this plant. This is a great choice for growing outdoors or for growing edibles indoors. The pockets are larger than the pockets in the FloraFelt gardens, allowing you to grow larger plants which require a deeper root structure to develop properly. Depending on your plant choices, the foliage can cover the pockets as they mature, giving you a beautiful living wall. These planters are a new product for Woolly Pocket designed to make planting and care easier. It features a hard vented shell, a sturdy shape, and is equipped with a self-watering tank. The price point is lower on these Woolly Pocket products than the Wally Pockets. These planters are a good choice for large plants and/or trailing plants that will fall over the sides, concealing the planter. Take note of which planter you prefer. You will need to submit your choice when completing your order form. For a small vertical garden you can choose a Wally One pocket, a Living Wally Planter, or a GroVert Panel. Depending on your choice, you can grow two to three 6" plants or ten 4" plants. 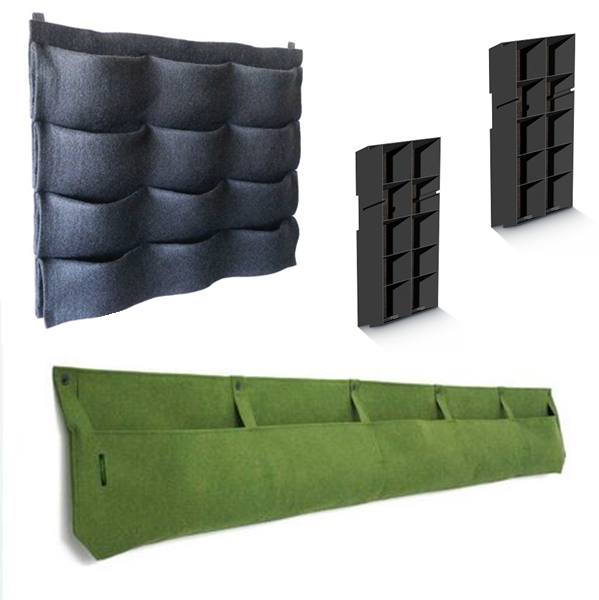 For a medium vertical garden you can choose a Wally Three pocket, a FloraFelt 4-Pocket, and/or a combination of the small size gardens. Depending on your choice, you can grow six to nine 6" plants or thirty 4" plants. For a large vertical garden you can choose a Wally Five, a FloraFelt 12-Pocket, and/or any combination of any other planters. Your options are limitless. Research & Design Service - We will work with you to figure out what type, size, and style of vertical garden will work for you then create a custom design for a vertical garden that is both aesthetically pleasing and provides for the optimal growing conditions for your chosen plants. This service is $25 per garden. Payment is due at the conclusion of the service. Plant Locator Service - This service is an optional add-on to the Research & Design service. After working with you to find the best plants for your garden we will find a plant nursery in your area who can supply these plants. This service is a cost-saving alternative to purchasing a fully planted vertical garden. In some cases arrangements can be made to have the plants delivered to you for a small fee, however, it may be necessary for you to pick the plants up. This service is $25 per garden and must be in conjunction with the Research & Design service. Payment is due at the conclusion of the service and does not include the cost of the plants. Plant & Ship - We help you design the perfect vertical garden, then plant and ship your garden to you. You will receive a fully planted and mature vertical garden in the mail, shipped to you using a shipping method proven to provide you with a happy and healthy end product. All gardens come with thorough instructions for simple installations. The cost for this service depends on the type and size of your garden, as well as your location. Prices can be found on the Gardens In A Box product description page. You can request this service for a custom garden if you would like a type or style of garden you do not see on the Gardens In A Box pages, by completing the form at the bottom of this page. Installation Service - This service is only offered for locations within a 250 mile radius of the 78704 zip code. This service includes the Research & Design service as well as a complete installation of the vertical garden and any accessories including Custom Supplemental Lighting and Automatic Irrigation products. The cost for this service depends on the location. Please see the Installation Service Regions & Rates page for more information. Scroll back up on this page to refresh your memory. Would you like to combine this garden with another? Scroll up to see the service descriptions. You are not locked in to this decision. By checking the box you are simply requesting more information. Are you interested in including any accessories with this garden? Check the box next to the accessory you are interested in and we will send you more information about how your garden can be customized with that accessory. Supplemental lighting - allows you to grow plants with higher light requirements than your space provides. Automatic Irrigation system - waters your garden automatically on the schedule you set. Thank you for completing this Order Form. We will be in touch with you asap to give you more information, including price estimates, and to get your order processed so you can start gardening on your walls! If you would like to speak with someone immediately, please call 1-888-652-0080. You can also email info@growediblewalls.com. Click the box above to see the order form for this garden. Fill out the form, making your selections for the options described on this page, and we will be in touch with you asap to go over the details and give you pricing information. This is simply a request for more information; you are not locked into any decisions by submitting this form.